The Mohawk and Hudson Railroad was the oldest segment of the NYC merger and was the first permanent railroad in the state of New York and one of the first railroads in the United States. It was chartered in 1826 to connect the Mohawk River at Schenectady to the Hudson River at Albany, providing a way for freight and especially passengers to avoid the extensive and time-consuming locks on the Erie Canal between Schenectady and Albany. The Mohawk and Hudson opened on September 24, 1831, and changed its name to the Albany and Schenectady Railroad on April 19, 1847. The Utica and Schenectady Railroad was chartered April 29, 1833; as the railroad paralleled the Erie Canal it was prohibited from carrying freight. Revenue service began August 2, 1836, extending the line of the Albany and Schenectady Railroad west from Schenectady along the north side of the Mohawk River, opposite the Erie Canal, to Utica. On May 7, 1844 the railroad was authorized to carry freight with some restrictions, and on May 12, 1847 the ban was fully dropped, but the company still had to pay the equivalent in canal tolls to the state. The Syracuse and Utica Railroad was chartered May 1, 1836, and similarly had to pay the state for any freight displaced from the canal. The full line opened July 3, 1839, extending the line further to Syracuse via Rome (and further to Auburn via the already-opened Auburn and Syracuse Railroad). This line was not direct, going out of its way to stay near the Erie Canal and serve Rome, and so the Syracuse and Utica Direct Railroad was chartered January 26, 1853. Nothing of that line was ever built, though the later West Shore Railroad, acquired by the NYC in 1885, served the same purpose. The Auburn and Syracuse Railroad was chartered May 1, 1834, and opened mostly in 1838, the remaining 4 miles (6.4 km) opening on June 4, 1839. A month later, with the opening of the Syracuse and Utica Railroad, this formed a complete line from Albany west via Syracuse to Auburn, about halfway to Geneva. The Auburn and Rochester Railroad was chartered May 13, 1836, as a further extension via Geneva and Canandaigua to Rochester, opening on November 4, 1841. The two lines merged on August 1, 1850, to form the rather indirect Rochester and Syracuse Railroad (known later as the Auburn Road). To fix this, the Rochester and Syracuse Direct Railway was chartered and immediately merged into the Rochester and Syracuse Railroad on August 6, 1850. That line opened June 1, 1853, running much more directly between those two cities, roughly parallel to the Erie Canal. The Tonawanda Railroad, to the west of Rochester, was chartered April 24, 1832 to build from said city to Attica. The first section, from Rochester southwest to Batavia, opened May 5, 1837, and the rest of the line to Attica opened on January 8, 1843. The Attica and Buffalo Railroad chartered in 1836 and opened on November 24, 1842, running from Buffalo east to Attica. When the Auburn and Rochester Railroad opened in 1841, there was no connection at Rochester to the Tonawanda Railroad, but with that exception there was now an all-rail line between Buffalo and Albany. On March 19, 1844, the Tonawanda Railroad was authorized to build the connection, and it opened later that year. The Albany and Schenectady Railroad bought all the baggage, mail and emigrant cars of the other railroads between Albany and Buffalo on February 17, 1848, and began operating through cars. On December 7, 1850, the Tonawanda Railroad and Attica and Buffalo Railroad merged to form the Buffalo and Rochester Railroad. A new direct line opened from Buffalo east to Batavia on April 26, 1852, and the old line between Depew (east of Buffalo) and Attica was sold to the Buffalo and New York City Railroad on November 1. The line was added to the New York and Erie Railroad system and converted to the Erie's 6 ft (1,829 mm) broad gauge. The Schenectady and Troy Railroad was chartered in 1836 and opened in 1842, providing another route between the Hudson River and Schenectady, with its Hudson River terminal at Troy. The Lockport and Niagara Falls Railroad was originally incorporated April 24, 1834 to run from Lockport on the Erie Canal west to Niagara Falls; the line opened in 1838 and was sold June 2, 1850. On December 14, 1850, it was reorganized as the Rochester, Lockport and Niagara Falls Railroad, and an extension east to Rochester opened on July 1, 1852. The railroad was consolidated into the New York Central Railroad under the act of 1853. A portion of the line is currently operated as the Falls Road Railroad. The Buffalo and Lockport Railroad was chartered April 27, 1852, to build a branch of the Rochester, Lockport and Niagara Falls from Lockport towards Buffalo. It opened in 1854, running from Lockport to Tonawanda, where it joined the Buffalo and Niagara Falls Railroad, opened 1837, for the rest of the way to Buffalo. In addition to the Syracuse and Utica Direct Railroad, another never-built company, the Mohawk Valley Railroad, was chartered January 21, 1851, and reorganized December 28, 1852, to build a railroad on the south side of the Mohawk River from Schenectady to Utica, next to the Erie Canal and opposite the Utica and Schenectady. The West Shore Railroad was later built on that location. Soon the Buffalo and State Line Railroad and Erie and North East Railroad converted to 4 ft 8 1⁄2 in (1,435 mm) standard gauge from 6 ft (1,829 mm) broad gauge and connected directly with the NYC in Buffalo, providing a through route to Erie, Pennsylvania. The Rochester and Lake Ontario Railroad was organized in 1852 and opened in Fall 1853; it was leased to the Rochester, Lockport and Niagara Falls Railroad, which became part of the NYC, before opening. In 1855 it was merged into the NYC, providing a branch from Rochester north to Charlotte on Lake Ontario. The Buffalo and Niagara Falls Railroad was also merged into the NYC in 1855. It had been chartered in 1834 and opened in 1837, providing a line between Buffalo and Niagara Falls. It was leased to the NYC in 1853. Also in 1855 came the merger with the Lewiston Railroad, running from Niagara Falls north to Lewiston. It was chartered in 1836 and opened in 1837 without connections to other railroads. In 1854 a southern extension opened to the Buffalo and Niagara Falls Railroad and the line was leased to the NYC. The Canandaigua and Niagara Falls Railroad was chartered in 1851. The first stage opened in 1853 from Canandaigua on the Auburn Road west to Batavia on the main line. A continuation west to North Tonawanda opened later that year, and in 1854 a section opened in Niagara Falls connecting it to the Niagara Falls Suspension Bridge. The NYC bought the company at bankruptcy in 1858 and reorganized it as the Niagara Bridge and Canandaigua Railroad, merging it into itself in 1890. The Saratoga and Hudson River Railroad was chartered in 1864 and opened in 1866 as a branch of the NYC from Athens Junction, southeast of Schenectady, southeast and south to Athens on the west side of the Hudson River. On September 9, 1876, the company was merged into the NYC, but in 1876 the terminal at Athens burned down and the line was abandoned. For current Metro-North Railroad operations, see West Side Line and Hudson Division. The Troy and Greenbush Railroad was chartered in 1845 and opened later that year, connecting Troy south to Greenbush (now Rensselaer) on the east side of the Hudson River. The Hudson River Railroad was chartered May 12, 1846, to extend this line south to New York City; the full line opened October 3, 1851. Prior to completion, on June 1, the Hudson River leased the Troy and Greenbush. Cornelius Vanderbilt obtained control of the Hudson River Railroad in 1864, soon after he bought the parallel New York and Harlem Railroad. Along the line of the Hudson River Railroad, the High Line was built in 1934 in New York City as an elevated bypass to street running trackage on Tenth Ave. The elevated section has since been abandoned, and the tunnel north of 35th Street is used only by Amtrak trains to New York Penn Station (all other trains use the Spuyten Duyvil and Port Morris Railroad to reach the Harlem Line). A surviving section of the High Line in Chelsea, Manhattan, reopened as a linear park in 2009–2014. In 1867 Vanderbilt acquired control of the Albany to Buffalo running NYC, with the help of maneuverings related to the Hudson River Bridge in Albany. On November 1, 1869 he merged the NYC with his Hudson River Railroad into the New York Central and Hudson River Railroad. This extended the system south from Albany along the east bank of the Hudson River to New York City, with the leased Troy and Greenbush Railroad running from Albany north to Troy. Vanderbilt's other lines were operated as part of the NYC; these included the New York and Harlem Railroad, Lake Shore and Michigan Southern Railway, Canada Southern Railway and Michigan Central Railroad. The Spuyten Duyvil and Port Morris Railroad was chartered in 1869 and opened in 1871, providing a route on the north side of the Harlem River for trains along the Hudson River to head southeast to the New York and Harlem Railroad. Trains could head toward Grand Central Depot, built by NYC and opened in 1871, or to the freight facilities at Port Morris. From opening it was leased by the NYC. The Geneva and Lyons Railroad was organized in 1877 and opened in 1878, leased by the NYC from opening. This was a north-south connection between Syracuse and Rochester, running from the main line at Lyons south to the Auburn Road at Geneva. 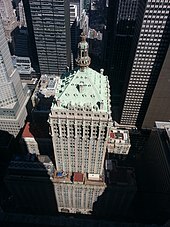 It was merged into the NYC in 1890. In 1885, the New York, West Shore and Buffalo Railway, a potential competitor with trackage rights along the west shore of the Hudson River, was taken over by the NYC as the West Shore Railroad, and developed passenger, freight, and car float operations at Weehawken Terminal. The NYC assumed control of the Pittsburgh and Lake Erie and Boston and Albany Railroads in 1887 and 1900, respectively, with both roads remaining as independently operating subsidiaries. In 1914, the operations of eleven subsidiaries were merged with the New York Central & Hudson River Railroad, re-forming the New York Central Railroad. From the beginning of the merge, the railroad was publicly referred to as the New York Central Lines. The identification was later changed to the New York Central System, the name being kept until the acquisition by the Pennsylvania Railroad. The Cleveland, Cincinnati, Chicago and St. Louis Railway, also known as the Big Four, was formed on June 30, 1889 by the merger of the Cleveland, Columbus, Cincinnati and Indianapolis Railway, the Cincinnati, Indianapolis, St. Louis and Chicago Railway and the Indianapolis and St. Louis Railway. The following year, the company gained control of the former Indiana Bloomington and Western Railway. By 1906, the Big Four was itself acquired by the New York Central Railroad. It operated independently until 1930, it was then referred to as the Big Four Route. The generally level topography of the NYC system had a character distinctively different than the mountainous terrain of its archrival, the Pennsylvania Railroad. Most of its major routes, including New York to Chicago, followed rivers and had no significant grades other than West Albany Hill. This influenced a great deal about the line, from advertising to locomotive design, built around its flagship New York-Chicago Water Level Route. A number of bypasses and cutoffs were built around congested areas. The Junction Railroad's Buffalo Belt Line opened in 1871, providing a bypass of Buffalo to the northeast, as well as a loop route for passenger trains via downtown. The West Shore Railroad, acquired in 1885, provided a bypass around Rochester. The Terminal Railway's Gardenville Cutoff, allowing through traffic to bypass Buffalo to the southeast, opened in 1898. The Schenectady Detour consisted of two connections to the West Shore Railroad, allowing through trains to bypass the steep grades at Schenectady. The full project opened in 1902. The Cleveland Short Line Railway built a bypass of Cleveland, Ohio, completed in 1912. In 1924, the Alfred H. Smith Memorial Bridge was constructed as part of the Hudson River Connecting Railroad's Castleton Cut-Off, a 27.5-mile-long freight bypass of the congested West Albany terminal area and West Albany Hill. An unrelated realignment was made in the 1910s at Rome, when the Erie Canal was realigned and widened onto a new alignment south of downtown Rome. The NYC main line was shifted south out of downtown to the south bank of the new canal. A bridge was built southeast of downtown, roughly where the old main line crossed the path of the canal, to keep access to and from the southeast. West of downtown, the old main line was abandoned, but a brand new railroad line was built, running north from the NYC main line to the NYC's former Rome, Watertown and Ogdensburg Railroad, allowing all NYC through traffic to bypass Rome. Steam locomotives of the NYC were optimized for speed on that flat raceway of a main line, rather than slow mountain lugging. Famous locomotives of the system included the well-known 4-6-4 Hudsons, particularly the 1937–38 J-3a's; 4-8-2 World War II–era L-3 and L-4 Mohawks; and the postwar S-class Niagaras: fast 4-8-4 locomotives often considered the epitome of their breed by steam locomotive aficionados. For two-thirds of the twentieth century the New York Central had some of the most famous trains in the United States. Its 20th Century Limited, begun in 1902, ran from Grand Central Terminal in New York to LaSalle Street Station, Chicago, and was its most famous train, known for its red carpet treatment and first class service. 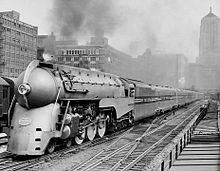 In the mid-1930s many railroad companies were introducing streamliner locomotives; until the New York Central introduced the Commodore Vanderbilt, all were diesel-electric. The Vanderbilt used the more common steam engine. The Century, which followed the Water Level Route, could complete the 960-mile trip in 16 hours after its June 15, 1938 streamlining (and did it in 15½ hours for a short period after World War II). Also famous was its Empire State Express through upstate New York to Buffalo and Cleveland, and Ohio State Limited from New York to Cincinnati. NYC also provided the Rexall Train of 1936, which toured 47 states to promote the Rexall chain of drug stores. Despite having some of the most modern steam locomotives anywhere, NYC's difficult financial position caused it to convert to more economical diesel-electric power rapidly. All lines east of Cleveland, Ohio were dieselized as of August 7, 1953. Niagaras were all retired by 1956. In 1957, H7e class 2-8-2 Mikado type steam locomotive #1977 is reported to have been the last steam locomotive to retire from service on the railroad. But, the economics of northeastern railroading became so dire that not even this switch could change things for the better. Trains left from Grand Central Terminal in New York, Weehawken Terminal in Weehawken, New Jersey, South Station in Boston, Cincinnati Union Terminal in Cincinnati, Michigan Central Station in Detroit, St. Louis Union Station, and LaSalle Street Station in Chicago. The New York Central had a network of commuter lines in New York and Massachusetts. Westchester County, New York had the railroad's Hudson, Harlem, and Putnam lines into Grand Central Terminal in Manhattan (Putnam Division trains required a change at High Bridge, New York), while New Jersey and Rockland County, New York were serviced by the West Shore Line between Weehawken and West Haverstraw, New York, on the west side of the Hudson River. The New York Central, like many U.S. railroads, declined after the Second World War. Problems resurfaced that had plagued the railroad industry before the war, such as over-regulation by the Interstate Commerce Commission (ICC), which severely regulated the rates charged by the railroad, along with continuing competition from automobiles. These problems were coupled with even more formidable forms of competition, such as airline service in the 1950s that began to deprive NYC of its long-distance passenger trade. The Interstate Highway Act of 1956 helped create a network of efficient roads for motor vehicle travel through the country, enticing more people to travel by car, as well as haul freight by truck. The 1959 opening of the Saint Lawrence Seaway adversely affected NYC freight business. Container shipments could now be directly shipped to ports along the Great Lakes, eliminating the railroads' freight hauls between the east and the Midwest. The NYC also carried a substantial tax burden from governments that saw rail infrastructure as a source of property tax revenues – taxes that were not imposed upon interstate highways. To make matters worse, most railroads, including the NYC, were saddled with a World War II-era tax of 15% on passenger fares, which remained until 1962, 17 years after the end of the war. In June 1954, management of the New York Central System lost a proxy fight in 1954 to Robert Ralph Young and the Alleghany Corporation he led. Alleghany Corporation was a real estate and railroad empire built by the Van Sweringen brothers of Cleveland in the 1920s that had controlled the Chesapeake and Ohio Railway (C&O) and the Nickel Plate Road. It fell under the control of Young and financier Allan Price Kirby during the Great Depression. R. R. Young was considered a railroad visionary, but found the New York Central in worse shape than he had imagined. Unable to keep his promises, Young was forced to suspend dividend payments in January 1958. He committed suicide later that month. After Young's suicide, his role in NYC management was assumed by Alfred E. Perlman, who had been working with the NYC under Young since 1954. Despite the dismal financial condition of the railroad, Perlman was able to streamline operations and save the company money. Starting in 1959, Perlman was able to reduce operating deficits by $7.7 million, which nominally raised NYC stock to $1.29 per share, producing dividends of an amount not seen since the end of the war. By 1964 he was able to reduce the NYC long term debt by nearly $100 million, while reducing passenger deficits from $42 to $24.6 million. Perlman also enacted several modernization projects throughout the railroad. Notable was the use of Centralized Traffic Control (CTC) systems on many of the NYC lines, which reduced the four-track mainline to two tracks. He oversaw construction and/or modernization of many hump or classification yards, notably the $20-million Selkirk Yard which opened outside of Albany in 1966. Perlman also experimented with jet trains, creating a Budd RDC car (the M-497 Black Beetle) powered by two J47 jet engines stripped from a B-36 Peacemaker bomber as a solution to increasing car and airplane competition. The project did not leave the prototype stage. Perlman's cuts resulted in the curtailing of many of the railroad's services; commuter lines around New York were particularly affected. In 1958-1959, service was suspended on the NYC's Putnam Division in Westchester and Putnam counties, and the NYC abandoned its ferry service across the Hudson to Weehawken Terminal. This negatively impacted the railroad's West Shore Line, which ran along the west bank of the Hudson River from Jersey City to Albany, which saw long-distance service to Albany discontinued in 1958 and commuter service between Jersey City and West Haverstraw, New York terminated in 1959. Ridding itself of most of its commuter service proved impossible due to the heavy use of these lines around metro New York, which government mandated the railroad still operate. Many long-distance and regional-haul passenger trains were either discontinued or downgraded in service, with coaches replacing Pullman, parlor, and sleeping cars on routes in Michigan, Illinois, Indiana, and Ohio. The Empire Corridor between Albany and Buffalo saw service greatly reduced with service beyond Buffalo to Niagara Falls discontinued in 1961. On December 3, 1967, most of the great long-distance trains ended, including the famed "Twentieth Century Limited". The railroad's branch line service off the Empire Corridor in upstate New York was also gradually discontinued, the last being its Utica Branch between Utica and Lake Placid, in 1965. Many of the railroad's great train stations in Rochester, Schenectady, and Albany were demolished or abandoned. Despite the savings these cuts created, it was apparent that if the railroad was to become solvent again a more permanent solution was needed. One problem that many of the Northeastern railroads faced was the fact that the railroad market was saturated for the dwindling rail traffic that remained. The NYC had to compete with its two biggest rivals: the Pennsylvania Railroad (PRR), and the Baltimore and Ohio Railroad (B&O), in addition to more moderate-size railroads such as the Delaware, Lackawanna, and Western Railroad (DLW), the Erie Railroad, the Reading Company, the Central Railroad of New Jersey, and the Lehigh Valley Railroad. Mergers of these railroads seemed a promising way for these companies to streamline operations and reduce the competition. The DL&W and Erie railroads had showed some success when they began merging their operations in 1956, finally leading to the formation of the Erie Lackawanna Railroad in 1960. Other mergers combined the Virginian Railway, Wabash Railroad, Nickel Plate Road and several others into the Norfolk and Western Railway (N&W) system, and the Baltimore and Ohio Railroad (B&O), Western Maryland Railroad (WM), and Chesapeake and Ohio Railway (C&O) combined with others to form the Chessie System. Heavy streamlining and reduction in passenger services led to the success of many of these mergers. Following this trend, the NYC began to look for a potential railroad to merge with as early as the mid-1950s and had originally sought out mergers with the B&O and the NYC-controlled Nickel Plate Road. Unlike the aforementioned mergers, however, a NYC merger proved tricky due to the fact that the railroad still operated a fairly extensive amount of regional and commuter passenger services that were under mandates by the Interstate Commerce Commission to maintain. It soon became apparent that the only other railroad with enough capital to allow for a potentially successful merger proved to be the NYC's chief rival, the PRR: itself a railroad that still had a large passenger trade. Merger talks between the two roads were discussed as early as 1955; however, this was delayed due to a number of factors: among them, interference by the Interstate Commerce Commission, objections from operating unions, concerns from competing railroads, and the inability of the two companies themselves to formulate a merger plan, thus delaying progress for over a decade. Two major points of contention centered on which railroad should have the majority controlling interest going into the merger. Perlman's cost-cutting during the '50s and '60s put the NYC in a more financially healthy situation than the PRR. Nevertheless, the ICC, with urging by PRR President Stuart T. Saunders, wanted the PRR to absorb the NYC. Another point centered on the ICC's wanting to force the bankrupt New York, New Haven and Hartford Railroad, better known as the New Haven, into the new system, which it did in 1969, something to which both companies objected. Eventually, both points would ultimately lead to the new Penn Central's demise. In December 1967, the New York Central published its last public timetable. The final timetable revealed a drastically truncated passenger schedule in anticipation of its merger with the PRR. Most deluxe long-distance passenger trains ended on December 3, 1967, including the famed 20th Century Limited. Only those trains which were to be continued after the merger with the PRR were retained, along with the railroad's commuter trains. On February 1, 1968, the New York Central was absorbed by the Pennsylvania Railroad, forming the new Pennsylvania New York Central Transportation Company that was eventually renamed the Penn Central Transportation Company, with the NYC's Alfred Perlman as president. Penn Central was quickly saddled with debt when the ICC forced the money-losing New Haven into the railroad in 1969. In addition, the merger was handled in a haphazard manner with no formal merger plan implemented. The two companies' competing corporate cultures, union interest, and incompatible operating and computer systems sabotaged any hope for a success. Additionally in an effort to look profitable, the board of directors authorized the use of the railroad's reserve cash to pay dividends to company stockholders. Nevertheless, on June 21, 1970, Penn Central declared bankruptcy – the largest private bankruptcy in the United States to that time. Under bankruptcy protection many of Penn Central's outstanding debts owed to other railroads were frozen, while debts owed to Penn Central by the other roads were not. This sent a trickle effect throughout the already fragile railroad industry forcing many of the other Northeastern railroads into insolvency, among them the Erie Lackawanna, Boston and Maine, the Central Railroad of New Jersey, the Reading Company, and the Lehigh Valley. Penn Central marked the last hope of privately funded passenger rail service in the United States. In response to the bankruptcy President Richard Nixon signed into law the Rail Passenger Service Act of 1970 which formed the National Railroad Passenger Corporation, better known as Amtrak, a government-subsidized railroad system. On May 1, 1971, Amtrak took over operation of most regional and long distance intercity passenger trains in the United States. Amtrak would eventually assume ownership of the Northeast Corridor, a mostly electrified route between Boston and Washington, D.C., inherited primarily from the PRR and New Haven systems. Penn Central and the other railroads were still obligated to operate their commuter services for the next five years while in bankruptcy, eventually turning them over to the newly formed Conrail in 1976. There was some hope that Penn Central, and the other Northeastern railroads, could be restructured towards profitability once their burdensome passenger deficits were unloaded. However, this was not to be and the railroads never recovered from their respective bankruptcies. Conrail, officially the Consolidated Rail Corporation, was created by the U.S. government to salvage Penn Central, and the other bankrupt railroads freight business, beginning its operations on April 1, 1976. As mentioned, Conrail assumed control of Penn Central's commuter lines throughout the Lower Hudson Valley of New York, Connecticut, and in and around Boston. In 1983 these commuter services would be turned over to the state funded Metro-North Railroad in New York and Connecticut, and Massachusetts Bay Transportation Authority in Massachusetts. Conrail would go on to achieve profitability by the 1990s and was sought by several other large railroads in a continuing trend of mergers eventually having its assets absorbed by CSX and Norfolk Southern. Conrail, in an effort to streamline its operations, was forced to abandon miles of both NYC and PRR trackage. Nevertheless, the majority of the NYC system is still intact and used by both CSX and Amtrak. Among the lines still used are the famed Water Level Route between New York and Chicago, as well as its former Boston & Albany line between these points, the Kankakee Belt Route through Indiana, Illinois, and Iowa, and the West Shore Line between Jersey City and the Albany suburb of Selkirk where the old NYC – now CSX – Selkirk Yard is among the busiest freight yards in the country. On June 6, 1998, most of Conrail was split between Norfolk Southern and CSX. New York Central Lines LLC was formed as a subsidiary of Conrail, containing the lines to be operated by CSX; this included the old Water Level Route and many other lines of the New York Central, as well as various lines from other companies. It also assumed the NYC reporting mark. CSX eventually fully absorbed it, as part of a streamlining of Conrail operations. ^ Totals include B&A, MC, CCC&StL, Cinc Northern and EI&TH, but not P&LE, Fulton Chain, Raquette Lake, Federal Valley, Kankakee & Seneca or Chicago Kalamazoo & Saginaw. ^ Lawrence, Scot. "Scots webpages have moved". gold.mylargescale.com. Archived from the original on 24 March 2012. Retrieved 6 May 2018. ^ "The New York Central System". american-rails.com. Archived from the original on 20 October 2017. Retrieved 6 May 2018. ^ "Class H-7e Mikado No. 1977". Archived from the original on 2018-01-09. ^ "Brief History of the U.S. Passenger Rail Industry". Archived from the original on 2007-10-23. ^ "RAILROADS: Young Takes Over -- Printout -- TIME". www.time.com. Retrieved 6 May 2018. ^ a b Totals include subsidiary roads like B&A, MC, Big Four, EI&TH, K&M etc but not P&LE, Kankakee & Seneca, Fulton Chain, Raquette Lake or Federal Valley. Wikimedia Commons has media related to New York Central Railroad.